It's often cited as the source of all nutritional (and environmental) evil and still: The experimental evidence informs us that the epidemiologically instigated politically subsidized meat hating is unreasonable. I wanted to start this article with the words "I actually don't know why" and follow it up with the statement "pork has gotten such a be rep," but that would be incorrect: After giving it a brief thought, I do know why pork has gotten such a bed rep as the unhealthiest meat source there is. It's not a religious question as some of you may believe. It's rather a matter of the end-consumer products that are made of pork. sausages & co are not good for your health, but that's not because they are made of pork, but rather because they consist of highly processed waste no one of you would eat, if it was served in its original form - and that in spite of the fact that the unprocessed garbage would probably be healthier than the final hot dog. 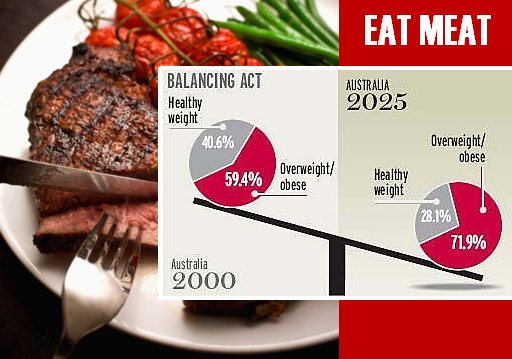 "Meat" and "Pork" are not the problems: That pork per se is not a problem and pork-consumers can - probably to the great astonishment of the average dietitian - improve their body composition without diet and exercise by its regular consumption is the results of a recent 6-months study by researchers from the University of South Australia in Adelaide (Murphy. 2014). The participants, , 49 overweight or obese adults were randomly assigned to consume up to 1kg/week of pork, chicken or beef, in an otherwise unrestricted diet for three months. To avoid the "saussages" effect the male and female participants were given seven (men) or five (women) portions of "their" meat per week and told to incorporate it into their habitual diet. 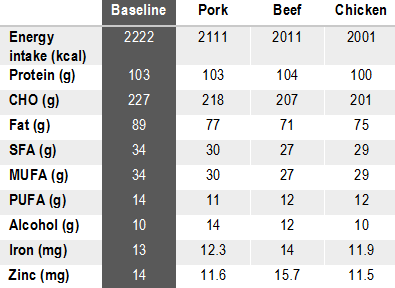 As the meats were matched on energy per serving, the portion sizes varied slightly (pork 140 g/serve, chicken 150 g/serve, beef (red meat) 150 g/serve). Next to their food intake, the subjects also had to log their physical activity in three-day logs (2x week + 1x weekend). This data was then used by the researchers to calculate the energy expenditure (kcal) for every 15 min period in a 24 h day according to nine categories of different types of activity (e.g., sleeping, playing sports, gardening etc.) and multiplied by the appropriate physical activity level factor for the reported intensity of exercise. Just to clarify things: There was no energy restriction and/or exercise regimen involved and the data the scientists gathered confirms that the only meaningful changes that occurred were the intended substitutions / additions of lean pork, beef and chicken meat! As it turned out, there were no differences in either the total energy or macronutrient intake between the groups; and on the micronutrient side of things, the only measurable difference was a minimally (but statistically significantly) elevated zinc intake in the beef group. 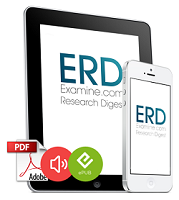 ... the researchers did not observe any negative side effects in either of the groups. 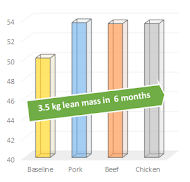 In other words: Simply eating more - not less - lean and mostly "clean" (=unprocessed) meat lead to a significant and unquestionably health-relevant reduction in abdominal fat and corresponding increases in lean mass. Bottom line: The significance of the decrease in fat and increase in lean mass, the researcher observed in the study at hand can hardly be overestimated. Unfortunately, there are still way too many men and even more women who consider the "weight loss" their main "health goal" - a goal, of which Allison et al. (1999) have been able to show that it increases all-cause mortality, which a loss of body fat, as it occured in the study at hand, lowers all-cause mortality! Suggested read: "Reduced Weight Gain, Improved Insulin Sensitivity and No Adverse Side Effects from 'Red Meat Supplementation' Even in Rodents!" | read more. Allison, D. B., et al. "Weight loss increases and fat loss decreases all-cause mortality rate: results from two independent cohort studies." International Journal of Obesity & Related Metabolic Disorders 23.6 (1999). Murphy, Karen J., et al. 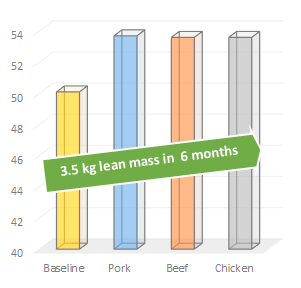 "A Comparison of Regular Consumption of Fresh Lean Pork, Beef and Chicken on Body Composition: A Randomized Cross-Over Trial." Nutrients 6.2 (2014): 682-696. Petzke, Klaus J., Susen Lemke, and Susanne Klaus. "Increased fat-free body mass and no adverse effects on blood lipid concentrations 4 weeks after additional meat consumption in comparison with an exclusion of meat in the diet of young healthy women." Journal of nutrition and metabolism 2011 (2011).